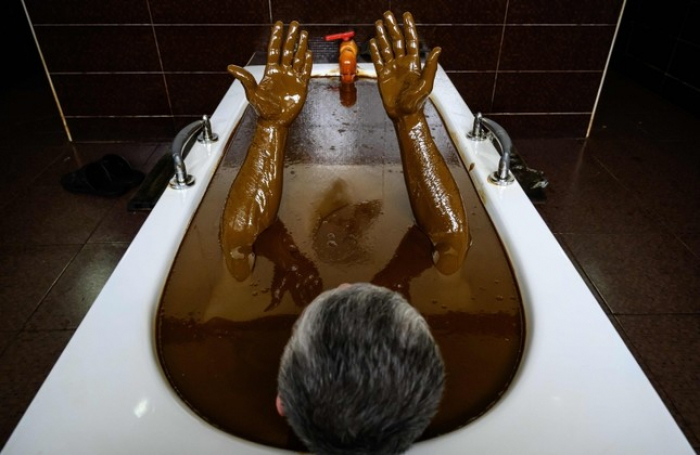 Sulfiya, a Russian woman in her 60s, has travelled to Azerbaijan's northwestern city of Naftalan in the hope that crude oil baths at a local sanatorium will end her years of suffering from polyarthritis, a disease affecting the joints. "This is so pleasant," she enthuses, despite the reek of engine oil. The native of Russia's Tatarstan region said she and her friends "have long dreamed of coming" for treatment in Naftalan. 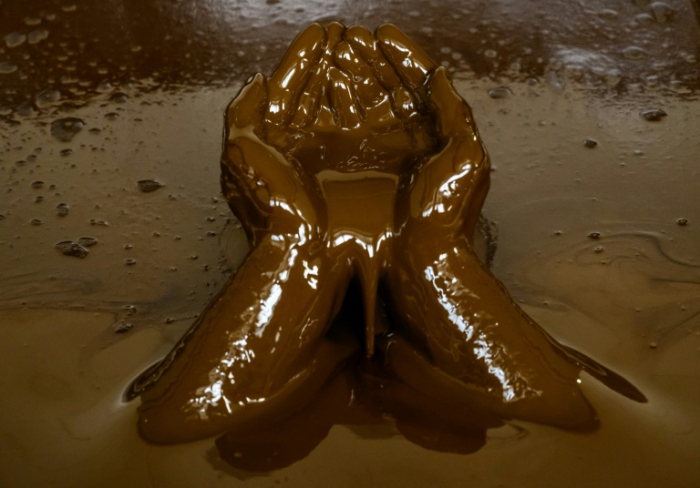 After 10 days of bathing in crude oil, Sulfiya says she now feels "much better" and has even reduced her medication for the polyarthritis that she has had for 12 years. "It is a gift from God," agrees 48-year-old Rufat, an Azerbaijani journalist and opposition party member who is undergoing treatment in the sanatorium called Sehirli, or "magic" in Azerbaijani. According to a legend, which spa staff readily tell clients, the healing properties of Naftalan's "miraculous oil" were discovered by accident when a camel left to die near a pool of oil was cured. 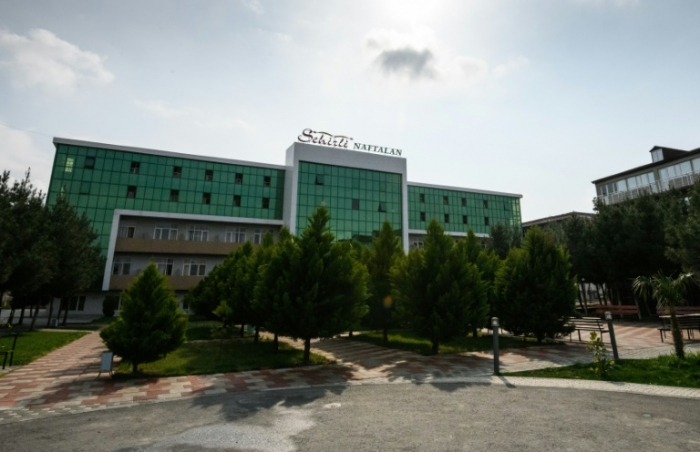 "In the past, when there weren't any hotels or sanatoriums, people would come to Naftalan and stay with locals," said one of the doctors at the Sehirli sanatorium, Fabil Azizov, sitting in her office under a portrait of President Ilham Aliyev. "But as time passed, sanatoriums were built and treatment methods developed." 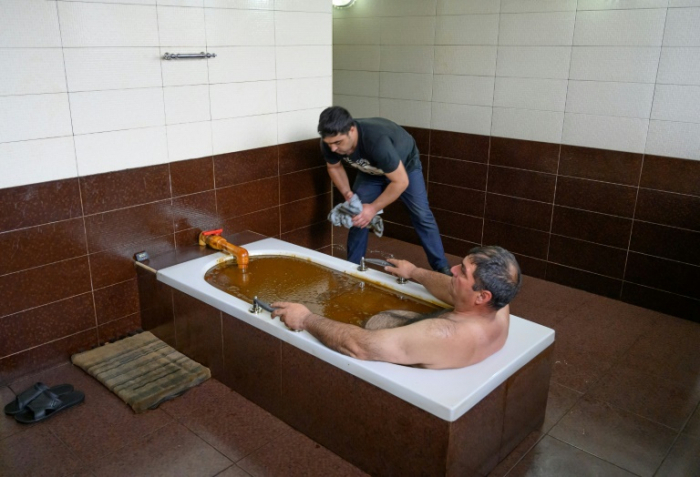 "Despite the stories of past cures, the use of crude oil for medicinal purposes has been condemned by Western doctors as potentially carcinogenic," former journalist Maryam Omidi wrote in a 2017 book published in Britain about Soviet-era sanatoriums. But in 1988, a bloody war began with neighboring Armenia for the control of Azerbaijan's Nagorno Karabakh region, which unilaterally proclaimed independence from Baku in 1991. During the war, the sanatoriums in Naftalan -- a few kilometers from the frontline -- were converted into hospitals for wounded soldiers and temporary accommodation for refugees. During one of the deadliest recent bouts of fighting in April 2016, "we heard gunshots," said a member of staff at Naftalan's luxurious Garabag spa, adding quickly that "everyone stayed on."